A short canoe paddle part of the way up Medvejie Lake and a brief hike to the base of a waterfall. In winter, the lake may be partially frozen, making it difficult to canoe across. The hike from the shore to the base of the falls takes about 10-15 minutes. The canoe trip may take more or less time, depending on the skill of the paddlers. The distance and time are based on starting at the end of Medvejie Lake Trail. Getting from the lake shore to the base of the falls involves a little bit of uphill. Getting across the lake is not difficult. It is fairly easy to tell the direction one needs to go to get from the shore to the base of the falls, but picking the best path to get up is not always as easy. In windy weather, canoeing can be a challenge going upwind. There is no real trail from the lake shore to the base of the falls. It is genearlly not difficult to follow the stream up, but in some places it may be necessary to scramble up boulders or through brush. 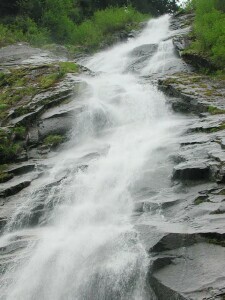 The falls are located about halfway up the lake on the Cross Mountain side (the right side as you look up the lake). A little point comes out with a small gravel beach. Canoe to this beach and follow the stream up to the base of the falls.